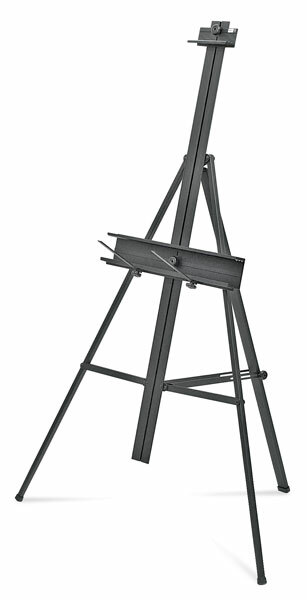 Lightweight and adjustable, the Torino Easel requires virtually no assembly. It folds and carries easily with a handle and ergonomic knobs. It stands 53" (135 cm) tall and can hold canvases up to 46" (117 cm). Torino has an attractive black aluminum finish. Tilt can be adjusted over a 30° range. Both upper and lower canvas supports can be adjusted to any height within the range of the central mast. 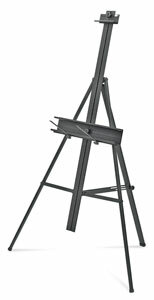 The lower canvas support measures 21" W × 1½" D, while the upper support measures 6" W × 1½" D.